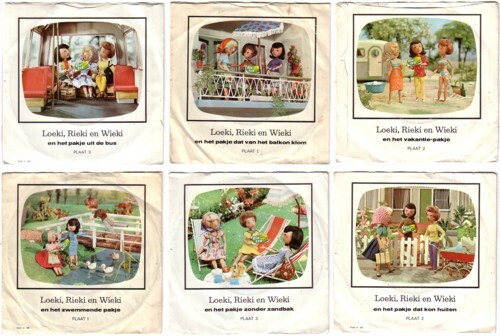 Ask hundred Dutch people my age if they know any advertisement records and I think that, if you get any answer at all, it would be a Biotex record. 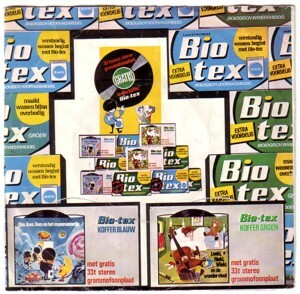 Biotex is a washing powder and in between 1968 and 1971 Kortman&Schulte NV (the company that produced Biotex) released nine hearplay records for little children. Stories with songs and sound effects, very well done by professionals. My father worked in a grocery store, so I had all these records when I was a kid. I cannot remember that I liked them very much, but I did listen to them and certain parts of these records will probably be among the last memories that my brain will give up. There was also a record made for the dealers, to explain them what this promotion campaign was all about. I don’t think there will be any body interested in this record, but I’ll post it here anyway. You cannot find much information about Dutch advertisement records on the Internet, and hardly any audio. But I saw some MP3’s of one of the Biotex records on a blog somewhere. Well, if you want to hear the complete collection, here is part one; the rest will be avaiable soon too.